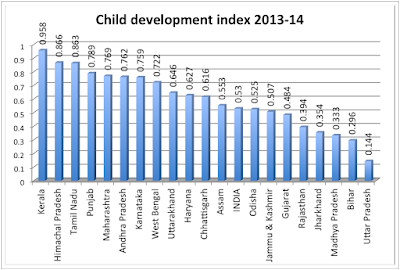 In an important exposure, Gujarat, touted till recently by Prime Minister Narendra Modi as the “model” state for others to follow, has been ranked No 15 among 20 major Indian states in child development index (CDI). The ranking has been calculated for 2013-14 by two top economists Reetika Khera and Jean Dreze on the basis of the Government of India’s recently released summary findings of the Rapid Survey On Children 2013-14 (RSOC). Both Khera and Dreze are development economists. While Khera teaches at the Indian Institute of Technology-Delhi, Dreze is a visiting professor at the Department of Economics at Ranchi University. Both are known for their closeness to Nobel Laureate Amartya Sen’s school of thought, which believes in a development model in which combines economic freedom, social protection and democracy. The new ranking suggests that Gujarat slipped by a point, from No 14 in 2005-06, when the third National Family Health Survey (NFHS) was carried out. The economists’ calculation also shows that while Gujarat’s CDI was 0.561 on a scale of 1 in 2005-06, which was above the national average (0.502), in 2013-14 it was 0.484, which is below the national average of 0.530. The state, which ranked No 1 both in 2005-06 and in 2013-14, was Kerala. This followed by Tamil Nadu in 2005-06 and Himachal Pradesh in 2013-14. 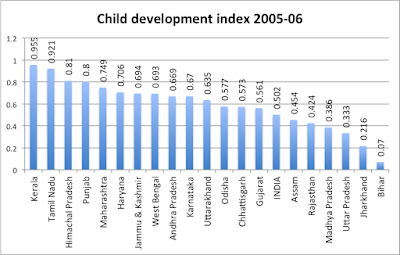 The worst performer in 2005-06 was Bihar, which ranked second from bottom in 2013-14, even though it witnessed considerable progress – from the CDI of 0.070 to 0.294 over the eight years. 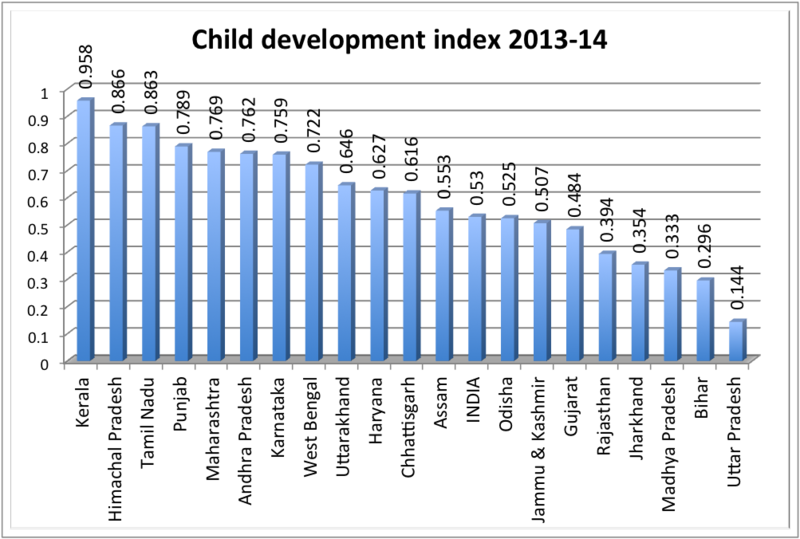 Uttar Pradesh ranked last in 2013-14 with a CDI of 0.144, down from 0.333 eight years earlier. 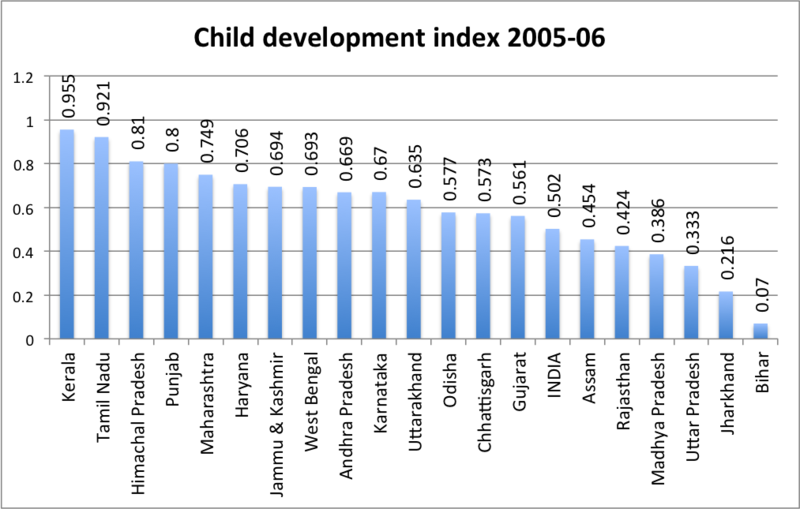 What is particularly significant is that it is not just the “developed” states, which score much better than Gujarat in the 2013-14 CDI – such as Himachal Pradesh (0.866), Tamil Nadu (0.863), Punjab (0.789), Maharashtra (0.769), Andhra Pradesh (0.762) and Karnataka (0.759). Even the “poorer” states such as Chhattisgarh, Assam and Odisha performed better than Gujarat with a CDI score of 0.616, 0.553, and 0.525 respectively. The CDI has been worked on the basis of taking into account four different categories – proportion of children aged 12-23 months who are fully immunized, female literacy rate in the age-group 10-14, proportion of births preceded by health checkup, and proportion of children below age 5 who are not underweight.